I am over-the-moon excited to share today’s post with you. I think we can all agree that the world needs more kindness. As parents, we work hard to raise children who care for others. One way to build empathy is through family service projects. Today, I am thrilled to welcome back Sarah Aaland, Director of Doing Good Together’s Big-Hearted Families™ Program. 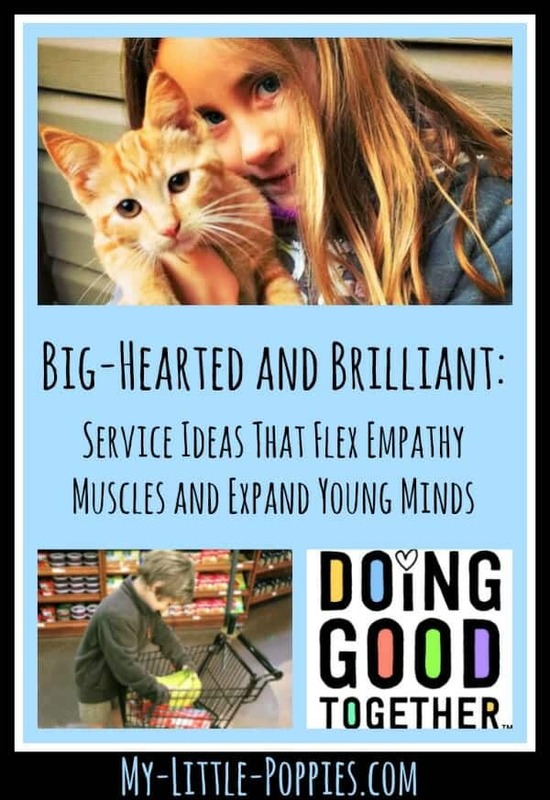 Sarah has shared family service ideas on My Little Poppies before, and today she is back with more service ideas and an important message: academic success and kindness are not mutually exclusive (despite those hurtful anti-gifted memes circulating the internet!). As parents, I think we can all agree, the world needs brilliant, big-hearted kids now more than ever. Something deep in the DNA of this nation and its pioneer roots mistrusts kindness and assumes compassion is weak. Meanwhile, intelligence is too often labeled elite, cold, or ruthless. In the past weeks, one well-intentioned meme has caused a lot of unrest. You remember the one that encouraged compassion for the lonely kid in the cafeteria. The one that seemed to pit academics against kindness. The one that implies we push our children too hard toward academics and not hard enough toward kindness. MBA Mom wrote a swift and elegant rebuttal summing up the many things this meme, and the beliefs behind it, get wrong. 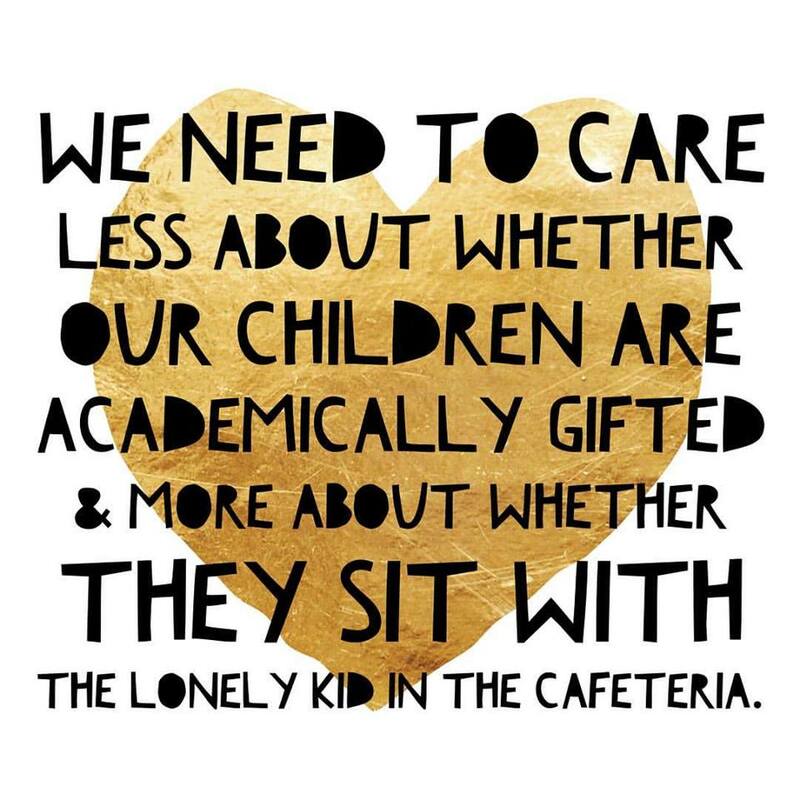 Too often, academically-exceptional kids are the lonely kid in the cafeteria. I believe the meme was meant to remind parents that a focus on kindness deserves a much higher ranking in personal priorities than it usually gets. But it furthered the stereotype that kindness and intelligence can’t go hand in hand. As a parent of above average children (I’m writing from Lake Wobegon, after all), I wonder, who among us wants to raise children who believe that academic success and kindness are an either-or proposition? The implication that they are mutually exclusive leaves kids rudderless just when they are searching to define themselves. And it comes up time and again in movies and television. The well-meaning kid is taken advantage of or bullied. Kind kids are the loveable goofs or the foolish pawns. The message kids receive is that kindness is only for the naive, the unprepared, or the powerless. And that brilliance is maniacal. As parents and our children’s best educators, we can flip this message on its head. Empowering kids to make a real, meaningful difference opens them up to learning opportunities that can literally change the world. For most of my parenting years, I’ve worked with Doing Good Together™, a national nonprofit dedicated to helping families form habits of kindness and traditions of volunteering. DGT’s or Doing Good Together’s resources make it easier for busy families to make kindness a part of every lesson. Help your brilliant child tap into their big-hearted instincts with some of my family’s favorite tools. Read about exceptionally kind kids. The evidence is all around us that big-hearted kids are astonishingly clever. Kids need to hear these stories. Parents need to hear these stories. Amazing innovation happens at the intersection of compassion and smarts. Read the stories and achievements of GenerationOn’s Hasbro Community Action Heroes to get inspired. Kids love to wrestle with big ideas when they are given the respect of being taken seriously. Clear time for your own family philosophy club and reflect on big questions. Check out Doing Good Together’s growing book collection, each with a set of reflection questions on the topic at hand. Or check out our 29 Big-Hearted Daily Conversation Starters. Hone in on your favorite hobby. What do you enjoy doing as a family? What is your child’s favorite activity or latest obsession? Your Lego enthusiast might enjoy starting a Lego Drive in your community. Your burgeoning musician may want to perform for a local nursing home or give lessons to younger children at a shelter. The opportunities are almost limitless, and if you’re in need of a little help, Doing Good Together is full of ideas. Contact us and we’ll help you find a project that matches your interest. We’ve even created a series of worksheets specifically designed to help you discover your next service project. SciStarter.com is an amazing site that will have your whole family excited to become citizen scientists. The array of projects available cover topics as varied as science itself, so whatever your child’s latest fascination, you’ll be able to find a project that fits. If your child likes to take charge, help them start their own philanthropic business venture. You can take this far beyond the classic lemonade stand. Last year, my daughter, a passionate animal lover, baked and sold pet treats to raise money for the Humane Society. She delighted in putting her own marketing campaign together, creating the perfect product, packaging, and tracking sales. And she raised a substantial chunk of money for her cause. Help your child consider what cause they care about and what skill they could put to use as a small, family fundraiser. You’ll be amazed at how far they can take it if they’re excited about their idea. Whatever project you complete, make time to tell your story. You will be reminding the world that kindness and smarts combine to make great things happen. Tech-loving kids might enjoy putting together their own (hopefully viral) video with an easy-to-use site like PowToons . You could share your story over at Doing Good Together, and let us spread the word about your project. Combining academics, life lessons, and habits of kindness has proven to be an effective way to overcome the stereotypes in popular culture. 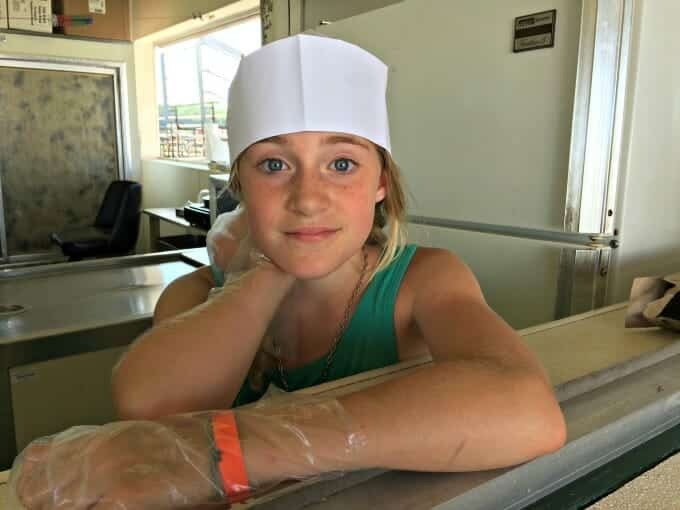 My daughters, at just nine and eleven, often come to me with creative ways to help others based on what they’re learning. When they hear of an injustice, whether it involves a friend at school or a country thousands of miles away, they passionately look for a way to make a difference. I credit much of this mindset with our involvement in intentional acts of kindness and empathetic service projects. Doing Good Together is not simply a nonprofit with useful tools. It’s the perfect way to introduce brilliant kids to big-hearted habits full of service, kindness, and intentionality. And it helps ensure we have more smart kids in the lunchroom brave enough to save a place at the table for every kid who doesn’t want to eat alone. Now, it’s your turn. Tell me: How does your family practice kindness? Share here. Are you parenting a gifted or twice-exceptional child? Parents of gifted and twice-exceptional learners need support, too. That is why Colleen Kessler and I have collaborated to create Raising Poppies, an online community for parents of gifted and twice-exceptional children. The Raising Poppies community is a special one. You can join by clicking the image below. Are you just starting out on the gifted/twice-exceptional journey? Are you the parent of a gifted or twice-exceptional child? 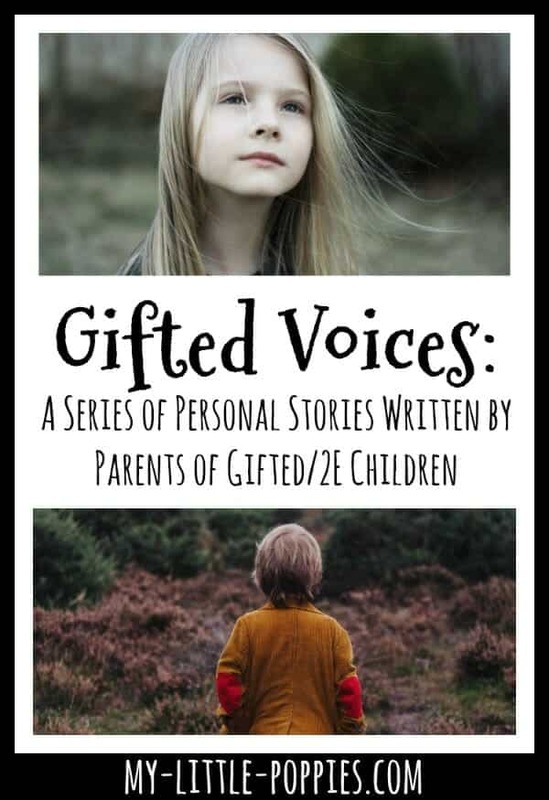 Be sure to check out Gifted Voices: A Series of Personal Stories. It helps to know that you are not alone on this journey. I will be adding to this series in the coming months, so stay tuned! So many of our emotionally intense kids need avenues to express their compassion and empathy. Love all the concrete ideas you provide!